Argyria results from prolonged contact with or ingestion of silver salts. 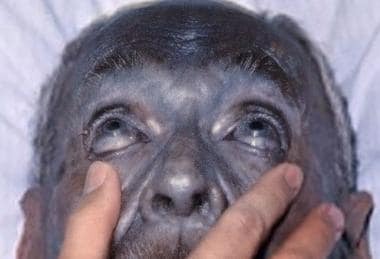 Argyria is characterized by gray to gray-black staining of the skin and mucous membranes produced by silver deposition. Silver may be deposited in the skin either from industrial exposure or as a result of medications containing silver salts. See the image below. A 92-year-old asymptomatic white man with generalized argyria. For many years, this man had used nose drops containing silver. His skin biopsy showed silver deposits in the dermis, confirming the diagnosis of argyria. © Dec 3, 2008 Herbert L. Fred, MD; Hendrik A. van Dijk. Textbook content produced by Herbert L. Fred, MD; Hendrik A. van Dijk is licensed under a Creative Commons Attribution License 2.0 license. See Clues on the Skin: Acute Poisonings, a Critical Images slideshow, to help diagnose patients based on their dermatologic presentations. Argyria has also been attributed to surgical and dental procedures (eg, silver amalgam-tattooing, silver sutures used in abdominal surgery). Blue macules have appeared at sites of acupuncture needles and silver earring sites. [6, 7] Great individual variability exists in the length of exposure and total dose needed to result in argyria. Localized argyria occurs in the conjunctiva or oral mucous membrane after long-term topical treatment with silver salt solutions or short-contact acupuncture. Universal argyria can develop after long-term systemic treatment with drugs that contain silver salts. This used to occur in patients who had taken silver protein suspension for chronic gastritis or gastric ulcer or as nose drops. Argyria also happens as an occupational disease in workers who prepare artificial pearls or who are employed in the cutting and polishing of silver (absorption of silver dust). The normal human body contains approximately 1 mg of silver; the smallest amount of silver reported to produce generalized argyria in humans ranges from 4-5 g to 20-40 g. Silver at 50-500 mg/kg body weight is the lethal toxic dose in humans. Although pigmentary changes occur primarily in sun-exposed sites, granules are evenly deposited throughout all skin. Differing theories exist as to why the blue-gray pigmentation is restricted to sun-exposed sites. Some believe that silver compounds complexed with proteins in the skin are reduced to elemental silver by light, similar to the process of photo imaging. Others contend that silver plus light stimulates melanogenesis, which results in the blue-gray color. Argyria has become a rare dermatosis, mainly because of the avoidance of silver-containing compounds as medicinals and a decrease in occupational exposure in the silver industry. Exposure to silver was common in the early part of this century. The famous Blue Man, a member of the Barnum and Bailey Circus sideshow, had a classic case of argyria. A permanent and irreversible metallic tinge occurs in the skin of patients with argyria. Bouts BA. Images in clinical medicine. Argyria. N Engl J Med. 1999 May 20. 340(20):1554. [Medline]. Fung MC, Bowen DL. Silver products for medical indications: risk-benefit assessment. J Toxicol Clin Toxicol. 1996. 34(1):119-26. [Medline]. Gulbranson SH, Hud JA, Hansen RC. Argyria following the use of dietary supplements containing colloidal silver protein. Cutis. 2000 Nov. 66(5):373-4. [Medline]. Brandt D, Park B, Hoang M, Jacobe HT. Argyria secondary to ingestion of homemade silver solution. J Am Acad Dermatol. 2005 Aug. 53(2 Suppl 1):S105-7. [Medline]. Gaslin MT, Rubin C, Pribitkin EA. Silver nasal sprays: misleading Internet marketing. Ear Nose Throat J. 2008 Apr. 87(4):217-20. [Medline]. Legat FJ, Goessler W, Schlagenhaufen C, Soyer HP. Argyria after short-contact acupuncture. Lancet. 1998 Jul 18. 352(9123):241. [Medline]. Rackoff EM, Benbenisty KM, Maize JC, Maize JC Jr. Localized cutaneous argyria from an acupuncture needle clinically concerning for metastatic melanoma. Cutis. 2007 Nov. 80(5):423-6. [Medline]. Prescott RJ, Wells S. Systemic argyria. J Clin Pathol. 1994 Jun. 47(6):556-7. [Medline]. Bianchi L, Orlandi A, Di Stefani A, Ricci R, Chimenti S. "Familial" generalized argyria. Arch Dermatol. 2006 Jun. 142(6):789-90. [Medline]. Shelley WB, Shelley ED, Burmeister V. Argyria: the intradermal "photograph," a manifestation of passive photosensitivity. J Am Acad Dermatol. 1987 Jan. 16(1 Pt 2):211-7. [Medline]. Menaguale G, Fazio R, Fazio M. Argyria: a case following the prolonged use of a rhinologic drug. Esper Dermatol (Roma). 2003. 4:299-303. Fisher NM, Marsh E, Lazova R. Scar-localized argyria secondary to silver sulfadiazine cream. J Am Acad Dermatol. 2003 Oct. 49(4):730-2. [Medline]. Gorayski P, Pinkham MB, Muir JB, Pullar AP. Severe acute radiation dermatitis in a patient with argyria. Case Rep Oncol Med. 2014. [Medline]. Alés-Fernández M, Ríos-Martín JJ, Camacho-Martínez FM. Localized argyria secondary to acupuncture mimicking blue nevus. J Drugs Dermatol. August 2010. 9(8):1019-20. [Medline]. Enei ML, Paschoal FM, Valdés R. Argyria mimicking a blue nevis: dermoscopy features. An Bras Dermatol. 2013 Jun. 88(3):[Medline]. Graham SA, O'Meara JM. The feasibility of measuring silver concentrations in vivo with x-ray fluorescence. Phys Med Biol. 2004 Aug 7. 49(15):N259-66. [Medline]. Cinotti E, Labeille B, Douchet C, Cambazard F, Perrot JL. Dermoscopy, reflectance confocal microscopy, and high-definition optical coherence tomography in the diagnosis of generalized argyria. J Am Acad Dermatol. 2017 Feb. 76 (2S1):S66-S68. [Medline]. García-Martínez P, López Aventín D, Segura S, Gómez-Martín I, Lloreta J, Ibáñez J, et al. In vivo reflectance confocal microscopy characterization of silver deposits in localized cutaneous argyria. Br J Dermatol. 2016 Nov. 175 (5):1052-1055. [Medline]. Sarnat-Kucharczyk M, Pojda-Wilczek D, Mrukwa-Kominek E. Diagnostic methods in ocular argyrosis: case report. Doc Ophthalmol. 2016 Oct. 133 (2):129-138. [Medline]. Lee SM, Lee SH. Generalized argyria after habitual use of AgNO3. J Dermatol. 1994 Jan. 21(1):50-3. [Medline]. Robinson-Bostom L, Pomerantz D, Wilkel C, et al. Localized argyria with pseudo-ochronosis. J Am Acad Dermatol. 2002 Feb. 46(2):222-7. [Medline]. Sato S, Sueki H, Nishijima A. Two unusual cases of argyria: the application of an improved tissue processing method for X-ray microanalysis of selenium and sulphur in silver-laden granules. Br J Dermatol. 1999 Jan. 140(1):158-63. [Medline]. Rhee DY, Chang SE, Lee MW, Choi JH, Moon KC, Koh JK. Treatment of argyria after colloidal silver ingestion using Q-switched 1,064-nm Nd:YAG laser. Dermatol Surg. 2008 Oct. 34(10):1427-30. [Medline]. Han TY, Chang HS, Lee HK, Son SJ. Successful treatment of argyria using a low-fluence Q-switched 1064-nm Nd:YAG laser. Int J Dermatol. 2011 Jun. 50 (6):751-3. [Medline]. Friedmann DP, Buckley S, Mishra V. Localized Cutaneous Argyria From a Nasal Piercing Successfully Treated With a Picosecond 755-nm Q-Switched Alexandrite Laser. Dermatol Surg. 2017 Aug. 43 (8):1094-1095. [Medline]. DiGiorgio CM, Wu DC, Goldman MP. Successful Treatment of Argyria Using the Picosecond Alexandrite Laser. Dermatol Surg. 2016 Mar. 42 (3):431-3. [Medline].